The Raiden node that belongs to Alice is going offline and Alice wants to be protected against having her channels closed by Bob with an incorrect balance proof. The Monitoring Service has to be registered in the ServiceRegistry contract. Registry slots will be auctioned. If chosen in the auction, the service provider will become part of the list of MSs and must deposit some RDN. Clients that want to request this service have to deposit an amount of RDN into the UDC in order to provide rewards to the MS. This happens during the general Raiden onboarding process, so that no additional preparation is necessary when usage of a MS is desired. All MS listen to a public Matrix room. Monitor Requests are broadcast and no specific MSs are appointed. The MSs can also publish their expected rewards in this room, which does not provide any guarantees, but increases the chance of reliable monitoring if both parties cooperate. The MS is paid after successfully submitting its client’s balance proof update. The payment is paid out from a deposit in the User Deposit Contract (UDC). Ideally, only one MS submits the latest BP to the SC to avoid unnecessary gas usage. This can be made more likely by choosing the rewarded MS based on a function of the MS’s address and the current block number. MSs which have a low f(address, block_num) would be incentivized to wait for a block number which yields a higher f for them, since they would probably lose out to another MS if they submitted the BP during the current block. Incentivizing MSs to wait in some cases greatly reduces the number of MSs submitting BPs simultaneously. The MS has an incentive to intervene in case of a dispute, since it is only paid in that case. There are no incentives for a high level of reliability and the client knows neither how many MSs are monitoring his channel nor how reliable they are. These tradeoffs are made to favor simplicity of implementation. The recipient and the actual transferred amounts are hidden by providing a hashed balance proof (or state). This provides some sort of privacy even if it can potentially be recalculated. Blinded BPs are published to the MS as part of the Monitor Request in the matrix room and then submitted to the smart contract. Clients can freely choose the reward for the MS, so it is easy for him to choose the amount in a way that makes the exchange attractive for himself. The client can’t know if a MS started monitoring his payment channel, so he can’t use such feedback to arrive at a reward where he knows that the deal is attractive for both him and the MS. Neither can he recognize if there is no such possible reward. The MS on the other hand can freely choose to ignore requests when the reward is too low, so he will only choose requests that he deems fairly rewarded. If the MS ignores the client’s request, the client keeps his deposit and it can be used by other MSs or for later BPs. In summary, the exchange is fair for both parties, but there is a high likelihood that no exchange will happen at all. MSs can put the clients channel deposit at risk by ignoring all client requests. But since a MS can’t force other MSs to ignore client requests, this can not be considered as framing. When only a single MS is monitoring the channel, the MS’s dispute intervention and the reward payment happen atomically inside the SC. In this case, no party can frame the other. When multiple MSs try to settle the same dispute, only the first one doing so receives a reward, but all of them have to invest resources to monitor the channel and spend gas to interact with the SC. If you find a way to continuously front run other MSs, you can drain their resources and block their only income. However, while doing so you fulfilled the MS’s duty to settle the payment channel correctly and protect the client’s deposit. In the short run, this is an acceptable outcome for the client. In the long run, this will drive other MSs out of business and thus reduce redundancy and reliability of the overall MS ecosystem. Since all MSs try to be the first to submit a BP, it is unlikely that a single MS will continuously be the fastest, but slightly slower MSs will still not get any rewards even if they are well behaved and reliable. If a client wants to waste the resources of MSs, he can first broadcast a BP with a high reward and keep more recent BPs to himself. When a dispute happens, he can wait for the MSs to act before submitting his latest BPs, which prevents the MSs from receiving a reward. Doing this at a large scale is expensive, since the client needs to open and close a payment channel for this at his own cost. There is no possibility of recourse which lets MSs operate without any incentive of high reliability. A client must expect MSs to ignore their requests and have no means to force a highly reliable monitoring. For each channel, only the latest (as indicated by the nonce) BP has to be saved. Unless an extremely high amount of channels is being monitored, this efficiency should not be a concern for the MS. A client can use a single deposit to request an MS to monitor all his payment channels. If this causes the MS to monitor a problematically high amount of channels, he can start to ignore requests made by this client, or even drop old requests. Since there is no punishment for failing to monitor a channel, stopping to monitor is a simple way to reduce resource usage when desired, although it should not be necessary under normal circumstances. Client’s request to store a balance proof will be in the usual scenario broadcasted using Matrix as a transport layer. A public chatroom will be available for anyone to join - clients will post balance proofs to the chatroom and Monitoring Services picks them up. Monitoring Service are required to have a synced Ethereum node with an enabled JSON-RPC interface. All blockchain operations are performed using this connection. MS must filter events for each onchain channel that corresponds to the submitted balance proofs. On ChannelClosed and NonClosingBalanceProofUpdated events state the channel was closed with the Monitoring Service must call updateNonClosingBalanceProof with the respective latest balance proof provided by its client. On ChannelSettled event any state data for this channel MAY be deleted from the MS. Monitoring Services uses JSON format to exchange the data. For description of the envelope format and required fields of the message please see Transport document. 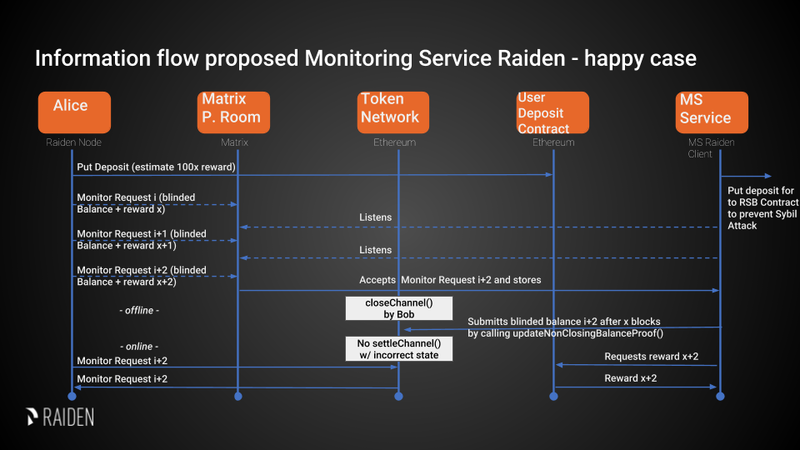 Monitor Requests are messages that the Raiden client broadcasts to Monitoring Services in order to get monitoring for a channel. reward_proof_signature string Signature of the reward proof data. The balance proof and its signature are described in the Balance Proof specification. The creation of the non_closing_signature is specified in the Balance Proof Update specification. The reward_proof_signature is specified below. All of this fields are required. Monitoring Service MUST perform verification of these data, namely channel existence. Monitoring service SHOULD accept the message if and only if the sender of the message is same as the sender address recovered from the signature. reward_amount uint256 Rewards received for updating the channel.